Our bodily functions decline with age. Before I lose all those functions, I want to live as fully and meaningfully as I can so that I won’t have any regrets. 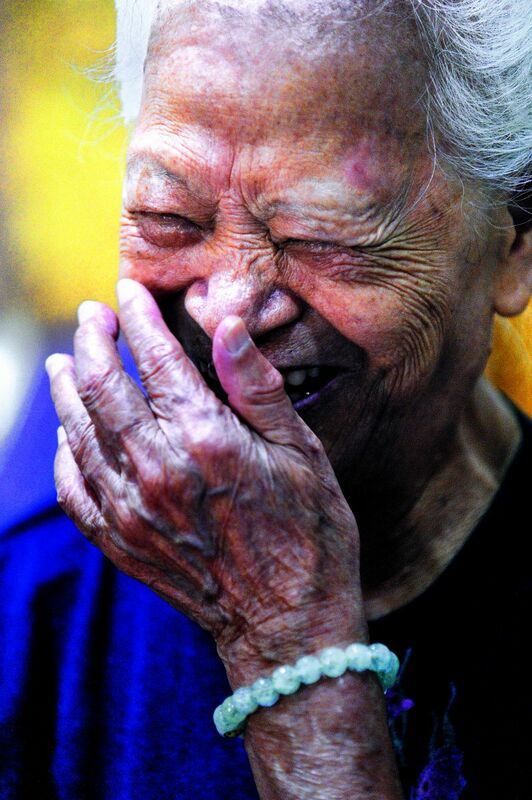 Relating an interesting anecdote, Cai Kuan (蔡寬) bursts into a big smile. My husband passed away when I was 34. Relying on my income as a midwife, I single-handedly brought up my four children. 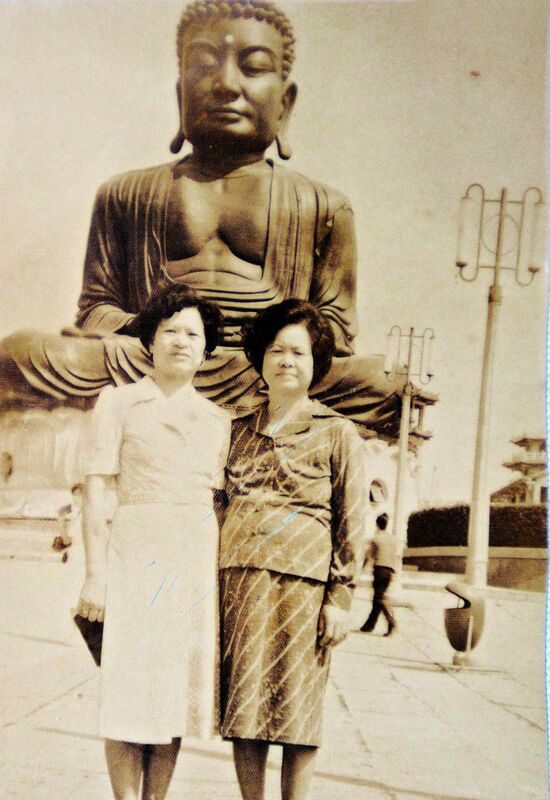 From the time when Japan ruled Taiwan (1895-1945) up to the early 1970s, Taiwanese depended on midwives to deliver babies; only in an emergency would a doctor’s help be sought. A baby could come into the world at any time. When the little life decided it was time to leave its mother’s warm womb, it didn’t care whether it was midnight or whether a typhoon was raging. It wasn’t unusual for me to hurry out of my home with my medical kit at the oddest hours. After the government launched a planned birth campaign, we midwives also began working to promote birth control. I worked for a public health clinic. Although the prescribed retirement age was 60, you could choose to open your own practice after you retired. My kids, who had grown up and had steady jobs by the time I reached 60, had seen what hard work was involved in my vocation, and they urged me not to work any more. Sometimes when people came to my home seeking my services, my children would tell them I was out, even though I was just upstairs. Gradually, after that happened time and again, no one came to ask for my services any more. For ten years after that I did a lot of traveling around the world with friends. Sometimes my kids took me abroad too. People envied me for having such a good life. 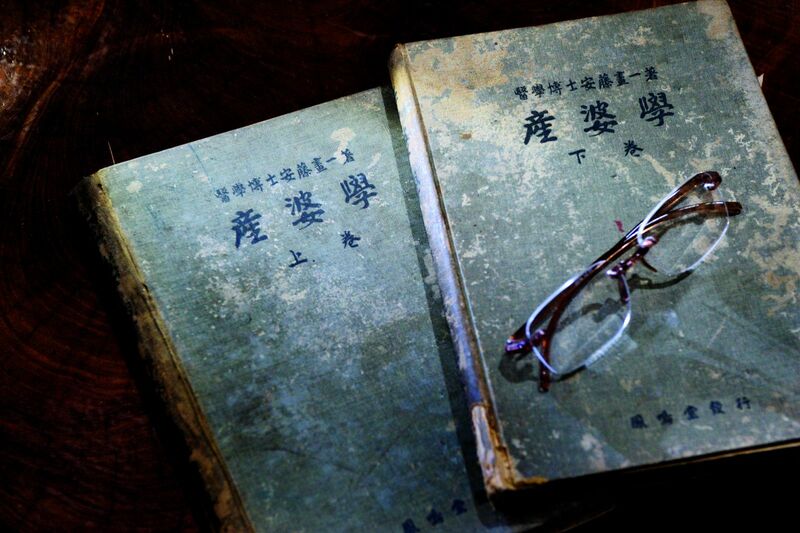 One day when I was in my late 60s, my friend Jiang Jin-fa (江金發) showed me a copy of Tzu Chi Monthly magazine. He told me about a Buddhist nun in Hualien, eastern Taiwan, who was very committed to helping the needy. I was surprised when I heard that—in my mind, all that Buddhist monks and nuns did was chant sutras and engage in spiritual practice. Curious, I decided to go to Hualien with Jiang and some friends and visit the place where the nun and her monastic disciples lived. While in Hualien, I saw how the nuns worked in the fields and did handiwork to support themselves. In addition to working hard for their own livelihood, they did their best to help the needy. 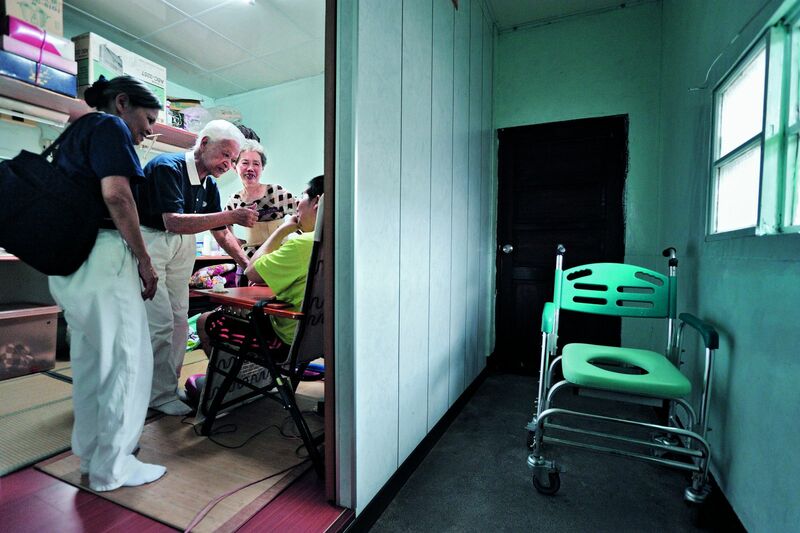 They had even built a hospital to serve people in eastern Taiwan, a comparatively remote area where medical resources were scarce. As I looked at the nuns, images of my past appeared vividly before my eyes. When I still worked as a midwife, I’d pay for medical supplies for destitute families. I’d even buy nutritional supplements for some new mothers because I knew their families wouldn’t be able to afford them. When the new mothers, still weak from their labor, held my hand tightly in theirs and thanked me, I always answered, “Don’t mention it.” I knew that the newborn would only add to the financial burden of the family. There was nothing much I could do to help them with that, so buying them the supplements was the least I could do. I had always wanted to help the needy; now that I was retired, I didn’t know how. But Tzu Chi offered me an opportunity to do that. After the trip to Hualien, I began to solicit donating members for Tzu Chi. I worked so hard on this that even in my sleep I dreamed of successfully enlisting yet another member. 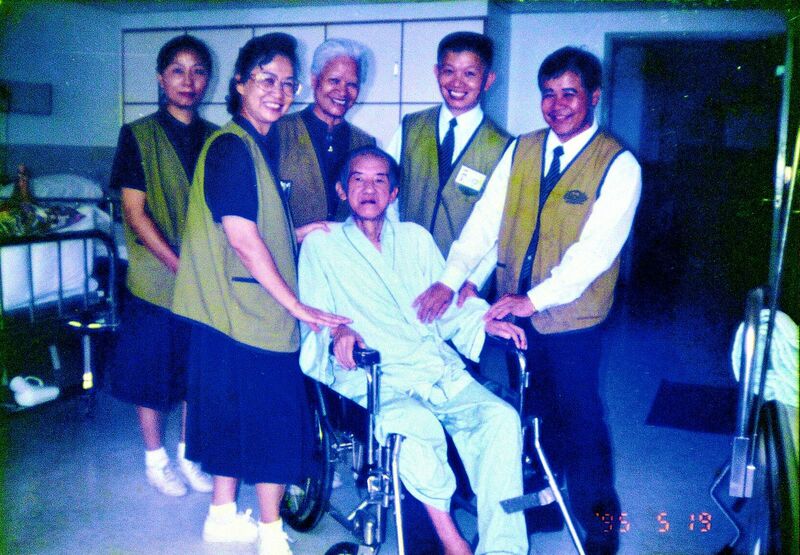 I also began volunteering at Hualien Tzu Chi Hospital. I made cotton balls, prepared bandages, cared for patients in the wards or outpatient areas, took people’s blood pressure at the blood pressure station, and guided people who weren’t familiar with the layout of the hospital to where they wanted to go. It wasn’t all smooth sailing though. When I first started volunteering at the hospital, a senior volunteer told us newer ones to “listen with your eyes and look with your ears.” I had no idea what she was talking about, but I was too embarrassed to ask. I just told myself I’d cross that bridge when I came to it. Soon afterwards, someone asked me to fetch a book. I readily agreed, but I came back with the wrong book. I felt so mortified. I thought, “Such a simple task and yet I managed to botch it.” The more I thought about this, the worse I felt—to the extent that the thought of quitting crossed my mind. That really woke me up. I thought to myself: “Where are the aspirations that led me to join Tzu Chi? Where is my commitment to helping the needy?” I decided then to keep an open mind and not to dwell on negative thoughts. I also reminded myself to be more mindful when I volunteered so that I could avoid mistakes. 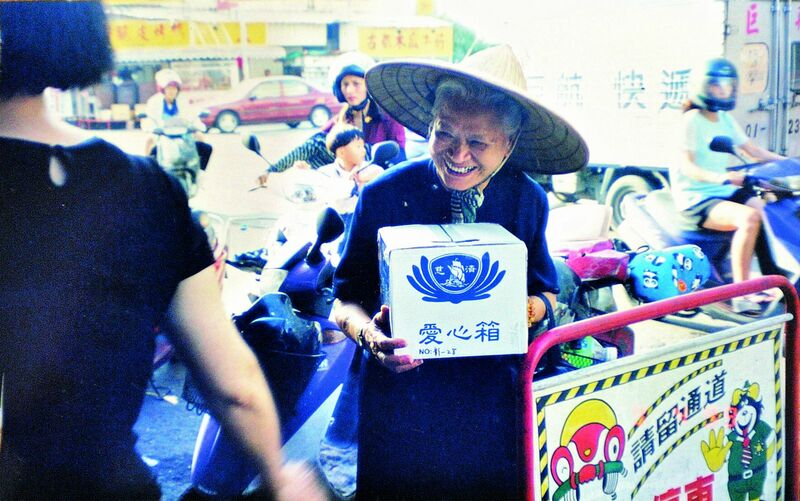 A few years after I started volunteering for Tzu Chi, four other volunteers and I visited a woman named A-shan. We were visiting her because someone had referred her to Tzu Chi. She lived alone, shunned the world, and locked herself in her house. No one knew how she would have survived if it weren’t for her neighbors, who often put food at her door. When we arrived and knocked on her door, she refused to open the door to us. She even called us swindlers and threw things at us. We tried to visit her again a couple of times, but the same thing happened. Every time I went to her home, I brought gifts and left them at her door. Her neighbors told me not to waste my time on her because she never talked to anyone and always thought others were out to do her harm. After a few times, however, instead of hiding inside, she would pop her head out the window to check on me. One day, she finally opened the door. She was a woman of few words and bad-tempered. If I accidentally said something that rubbed her the wrong way, she’d ask me to leave. It was dark inside her house. I said to her, “It’s so dark inside. Let me draw the curtain aside so you can see me better.” Afterwards, she quietly moved closer to me. Taking her hand in mine, I gazed at her and said, “You have such a dignified and beautiful face. I feel happy just looking at you. The sun is shining outside, and there are birds and trees. We haven’t done anything bad; people won’t intentionally harm us.” Before leaving, I said to her, “Take care. I’ll ask some volunteers to come in and put your bed in order for you.” She nodded and then said goodbye to me. With time, she grew friendlier and friendlier to me. I also got to know her better. I found out that her eyes were bad and everything looked blurry to her. That’s why she didn’t bother to let light into her house, let alone venture outside. I also learned that her children had left her without saying goodbye, which broke her heart and led her to close herself off. All of this made her feel insecure and suspicious of everyone. I kept her company for around three years. We became like sisters to each other. She would even go outside on her own and sun herself. Later, I moved away from that area to live with my eldest son and his family, and she died soon afterwards. On a visit to a needy family, Kuan was asked by the mistress of the house to say a few encouraging words to her physically challenged son. Every one of us received a tablet when we went to learn how to use it. I was completely lost during the class. The instructor used a lot of computer terms I had never heard before, and it was all gibberish to me. After I got home from the class and fumbled with the tablet some more, I decided that the thing was beyond me and went to return it to the Tzu Chi sister from whom I had received it. Knowing that I had been used as a poster child on this gave me the impetus to keep going. I thought that if people eventually learned how to use a tablet because of me, it would be a good thing, so I bit the bullet and kept at it. Even my son, then 65, learned how to use one in order to teach me. Even with that support, I kept forgetting what I had been taught. It took me a full year to finally learn the ropes. I get up early every morning and go to the local Tzu Chi office to attend Master Cheng Yen’s daily Dharma talk via video-conferencing. My memory has declined with age and I often forget what the Master just said a few minutes earlier. Even so, I make a point of listening to her talks and I take as many notes as I can. Even if I remember only one sentence a day, it will still do me good if I take it to heart and put it into practice. After the talk, I go to the park to exercise until past seven. Then I return home for breakfast. Keeping regular hours is good for you. Regular exercise is important too. I stretch for half an hour and walk half an hour every day. Strong legs lead to good health. The less you walk, the weaker you become. It is a real blessing if we can stay mobile and retain the ability to take care of ourselves as we get older. When I need to go out to volunteer, other volunteers drive by my home and pick me up. Though I feel bad about troubling them this way, they always say it’s no bother at all, so I’ve learned not to dwell on it. I really enjoy volunteering. Should a few days go by without my receiving a single volunteer assignment, I call the volunteers in charge and ask them not to pass me by just because I’m old. At that time, I met Wang Shen Yue-gui (王沈月桂) [She was Master Cheng Yen’s aunt who adopted the Master as her daughter]. 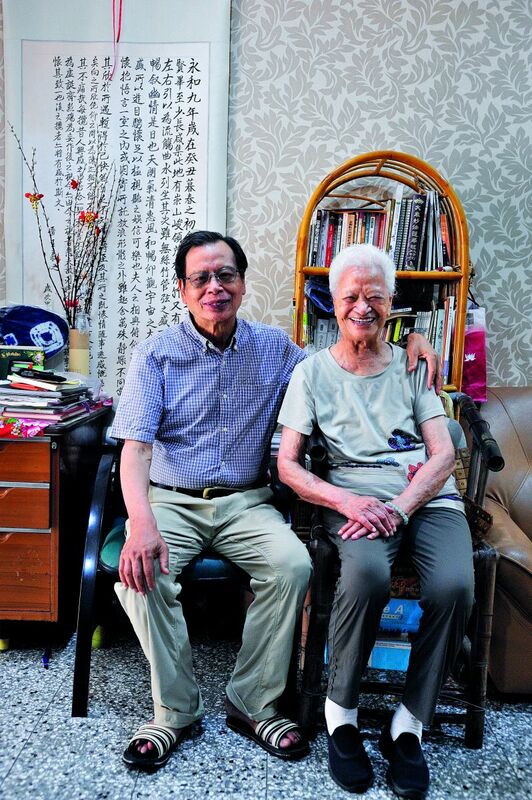 She was four years older than me, but despite her advanced age, she still worked tirelessly for Tzu Chi. She gave me a lot of encouragement and suggested that I take part in as much volunteer work as I could. I thought, “If she can do it, I can too.” Therefore, I mustered my courage and became a commissioner. I stopped feeling that one should live a life of ease and comfort when one gets old. Recalling those years when I spent a lot of time traveling for leisure, I felt that my money would have been better spent if I had donated it to help others. I told those relatives who had encouraged me to go enjoy life that if I could lead an active life as a volunteer, it meant that I still had good health and that they should be happy for me. Besides, volunteering was good for me. I used to be reserved and introverted, but after I started volunteering, I became more outgoing and felt more energetic. I was born in July 1919. I’m already one hundred now, but still I keep going. [For older Chinese, people are born at the age of one instead of zero]. When I serve as a hospital volunteer, I often see older people living on ventilators. There isn’t much dignity living like that. I count myself very lucky that at my age I’m still fit and able enough to go around volunteering. For that I’m very grateful. Many older volunteers often share their worries with me. They are afraid of falling ill and losing the ability to take care of themselves. I tell them illness is hard to avoid, especially when one gets older, but worrying about it won’t do any good. When you become sick, just go to the doctor. My advice to older people: Think positively, refrain from complaining, and lead an active lifestyle—these all translate into a healthy life. In fact, I rarely keep track of my age. But I’m reminded of how old I am every year when my children and grandchildren hold a birthday celebration for me. Even though I have always felt fit and healthy, recently I have begun to feel the decline of my body. Food that is too hard has become a challenge for my teeth to handle, and I can no longer walk as fast and nimbly as before. However, I don’t have any complaints. I’m content. I’ve lived to be a hundred. It is a matter of course for my physical and even mental functions to have declined. One day, I’ll lose all these functions. But I’ll have no regrets because I’ve lived a full life. Before I lose those functions, I’ll try my best to stay as healthy as I can so that I can do more to help others. For me, every second that I live is another second gained. 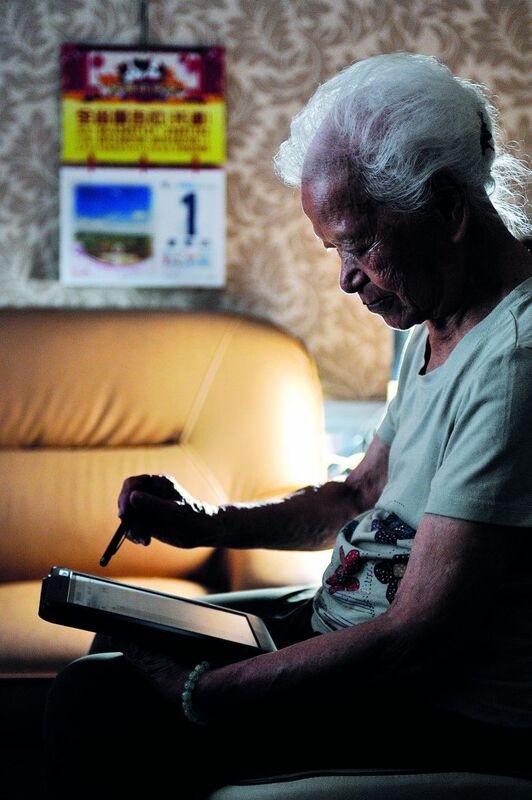 Kuan uses her own experience of learning to use a tablet computer when she was 93 to encourage others not to be afraid of learning new things just because they are old.